Your legs feel a bit like you’re trying to walk along the bottom of a swimming pool. You feel as though like walking on the moon. Cue the Police song getting stuck in my head. 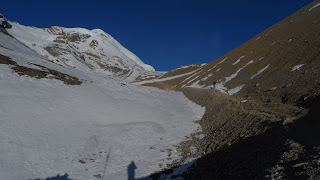 I’d spent the last twelve nights’ sleep at carefully selected altitudes to acclimatize well enough to make it comfortably over the five and a half kilometer high pass. You could tell who hadn’t. All the super fit groups of trekkers who figured they could make it in less than the recommended time were already back home days ago. As were all of those who didn’t schedule a few contingency days for sickness and snowstorms. The woman nearby that’s losing the power of speech mid sentence only tried to rush things by a day or two. Same with the one slumped over a horse being led up by a porter. Basically the higher you go, the less oxygen you get with each breath. By the top of the pass you’re getting about half as much in each breath as you’re used to. Apparently at the summit of Everest it’s down to about a third. If you decide to sleep too much higher than the previous night on any given day, you’ll know that you have soon enough. The headache you start feeling is from the fluids leaking in your skull creating too much pressure. It’s best not to find out the next symptoms. My mind slips back into focus on the task at hand: moving my right leg to a position slightly higher and further along the pass than my left leg and pulling my body forward. The landscape is barren and grim. Gone are the towering mountains over the valley – here the peaks rise only nominally above the ridge that I’m climbing. As I finally reach the highest point, I’m feeling pretty good. 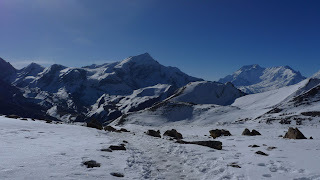 Especially after watching the other less acclimatized trekkers struggling with the altitude. Looking back behind me to appreciate the mountain landscape, one thing catches my attention. I haven’t left any footprints in the deep snow. Looks like my elven training has been paying off after all. The layer of ice frozen over the snow had nothing to do with it. This sounds and look incredible. im curious, how do you keep posting this info with pictures? there's internet in these towns where you can download pics via usb etc? Nah. I was cut off completely for a month! But as I'm walking sometimes I quietly compose things in my head when I start getting bored. 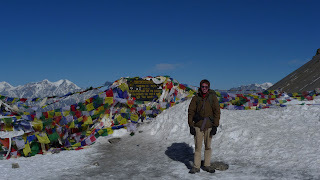 Then I arrive back in Pokhara and spend a full two days writing and dealing with emails, where I posted the whole lot of them all at once. Which just makes me never want to use the internet again for another month. It's so nice to be free of the internet! Your mind is so much more focused and your time is put to use so much better! Sorry, ramble. Nice to hear from you. I need to see some Dubai pics one of these days though! i have multiple albums up on facebook. recently i went camping in the desert. quite the experience.